Frequency analysis is where we take some playing audio and identify the volume level of each range of frequencies being played. In a simple example, this lets us identify the current volume of the bass, mid-range and treble in a song individually, or any other desired range of frequencies. Stuff you don’t really need to know: The analysis is done using a process called Fast Fourier Transforms (or FFT), which looks back in time at all the recently played frequencies to build up a picture of the volume of each. The FFT covers the whole spectrum up to the sample rate of the song (typically 44.1kHz) – or specifically, the so-called nyquist rate of the song (half of the actual sample rate – the highest frequency which can be measured for the audio), but you can specify how many equal-sized ranges to break this up into. The number of ranges is known as the sample size. So, for example, a sample size of 100 on a song sampled at 44.1kHz will produce a bucket of 100 ranges, each covering 220.5Hz (that’s half the sample rate, divided by the sample size, ie. (44100 / 2) / 100). Therefore, the higher the sample size, the more accurate the measurement, but at the cost of lag since the FFT algorithm must search further back in time from the current playback position the more samples are taken into account. Luckily, FMOD takes care of all this for you and all you need to do is tell it what sample size you want and it will return a float array containing a breakdown of the volume of each frequency range. What is frequency analysis for? Frequency analysis is the lowest level audio processing that must be performed to enable various other functionality. For example, you can use the resulting data to detect when there is a beat in a song (or other specific simple sound types). Here I am mostly concerned with video games and graphics, and it is a quite common effect to sync on-screen effects with the beat of a song. Using beat detection lets us trigger these effects in time with the music. Once you have beat detection, you can then use the timing information of each beat to estimate the bpm (beats per minute) of the song. While this is generally unimportant for games, it is essential for high-level audio processing applications such as DJ tools which alter the bpm of two songs so they can be mixed (crossfaded) without a break in the music. In this article, we will mostly look at how to use beat detection to trigger on-screen effects in games. The first step is to allocate memory to a float array, then pass a pointer to it to getSpectrum() in which to retrieve the volume distribution. The sample size must be a power of two in the range 64-8192. The third argument specifies which part of the audio to examine; for a stereo track, 0 represents the left channel and 1 the right channel. Here we retrieve the volume distribution for both. The fourth argument specifies a smoothing filter to use to help guard against false readings (false transients). FMOD_DSP_FFT_WINDOW_RECT uses a rectangular filter, which essentially means everything is allowed through. There are many ways to implement this but the combination of the C++ Standard Library template functions and a lambda function in C++11 is quite neat. The transform function performs an in-place transform of each volume to scale it relative to the maximum volume for the distribution. Don’t forget to change 44100 to the sample rate (in Hz) of the audio. Figure 1. VU bars. In this case the sample size is 128 on a track sampled at 44.1kHz, therefore there are 128 bars representing a range of 172.266Hz each. The lowest frequency ranges are shown on the left, with the height of each bar representing its average volume. VU bars are usually represented by a row of rectangles (or lines) with a common bottom Y co-ordinate, with the height of each rectangle representing the volume of the frequency range it represents – see Figure 1. This produces a display identical to that shown in figure 1 when placed in your application’s DrawScene() function. The principle of detecting when a beat occurs in the music is to examine a low frequency range (where the percussion occurs – typically 60-120Hz for a bass kick drum and 120-150Hz for a snare drum) to see if its volume exceeds a certain threshold value. In the following example, we simply consider the beat to have occurred when this threshold is exceeded, then ignore the volume of the track for a given period of time afterwards to avoid false positives. We also simply examine the lowest bar in the volume distribution which works for small sample sizes but will be looking at too low a frequency range for larger sample sizes. Ideally you should look at the frequency ranges above, but I leave that as an exercise for you. With a sample size of 128 and a track sampled at 44.1kHz, looking at the first item in the array will cover all frequencies from 0-172Hz, so it’s a reasonable estimate. A more sophisticated approach may aggregate the average of several bars from a larger sample size, and require the threshold to be exceeded for more than a single frame. Normalization should not be used when coding for beat detection, as it disproportionately distorts the volume distribution during quiet periods of the music. This code can of course be adapted in a variety of ways, but as it stands, beatLastTick will retain the system tick time of the last detected beat while the audio is being ignored, and 0 at all other times. On the first frame that the beat is detected, the trigger code will execute and you can generate on-screen effects or user interactions here. While not really needed for game development, I thought it would be interesting to include this by way of example. At the start, it should be noted that there are many ways to use beat detection data to calculate bpm – some more accurate than others – and the example below only produces makeshift estimates; it is not the best method. Also, bpm estimation relies on perfect beat detection, which is unlikely to be produced by the unsophisticated code above. The correct way of determining a song’s bpm: The song should be scanned from start to end in memory without playing it, and a frequency analysis performed on each frame. Beat detection should be performed on each frame from the frequency analysis results, and the relative times of every beat in the song stored in an array. Heuristics should be used to ignore portions of the song with no beat, and the remaining portion of the song should have its playback time divided into the number of beats. This will provide a fairly accurate calculation of the song’s true bpm. What happens here is that we take the times of the oldest and newest beats in the list, and divide them by the size of the list minus one (which is the number of gaps between the beats rather than the number of beats) to get the average number of milliseconds between each beat. We then divide this into one minute (60000 milliseconds) to get the estimate of the bpm, which is stored in bpmEstimate. To try the application, first press P to unpause the music after running the EXE file. You can use N to toggle normalization (beat detection and bpm estimation only run when normalization is off) and 1 and 2 to increase and decrease the FFT sample size. When normalization is off, the word ‘BEAT’ flashes on the screen when a beat is detected, and the current bpm estimation is shown at the bottom of the screen. I hope you found this exploration of frequency analysis in FMOD useful! In Part 5 we’ll check out how to generate audio on the fly from user-defined functions. If you want to do frequency analysis of real-time sound card output, check out Part 6 for the details! Enjoy. I’m concerned about your paramenter resolutionX resoltionY what does it mean? The screen or render target width and height in pixels. It is used to determine the width, maximum height and horizontal gap between each VU bar. You are free to ignore the example calculations and define the VU bar’s dimensions in any way you wish. The example code ensures that it auto-scales to the screen resolution. I have 4 questions X(. 1. When I do GetSpectrum() does this function gets the size of DB by the range of 0 ~ 44100 by itself(default)? or do i need to modify the range? 2. Right now I can modify the number of bars by changing the parameter sampleSize. If 1 bar range is 0Hz to 2Hz (total 3Hz) does it add up all the values (For Instance 0Hz : 1 , 1Hz : 0.5 , 2Hz : 0) and divides it in to 3? ( 1 + 0.5 + 0 ) /3 ? 3. Is the value of spec[i] maximum : 1.0 and minimum : 0.0? 4. Right now when I look at my window media Equalizer the height of the bars are quite similar. However, the example above the heights are way to different. 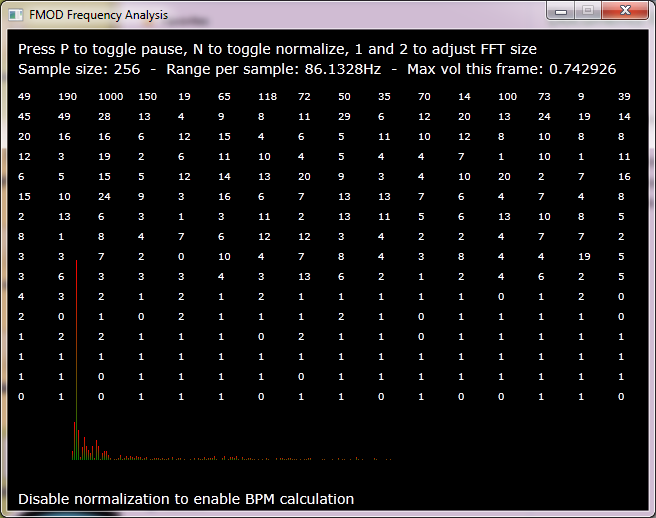 Therefore, does this mean that the Window media’s equalizer is showing only a part of Hz, or is it modifed some how? 1. getSpectrum gets the spectrum up to the recorded sample rate of the audio you have loaded. So if your audio is 96kHz, it will return the values for that range, if it is 44.1kHz, it will return the values for that range etc. 2. I believe that is how it works, dB is not a linear measurement but a logarithmic one so the way the values are averaged may be logarithmic rather than a linear division (normal average) but in any case, the output is some kind of average across all the frequencies from 0 to 1. 4. I don’t know how the windows EQ works but if I had to guess I would say that the VU bars shown there do not have normalized values. The example in the article shows both normalized and non-normalized versions. 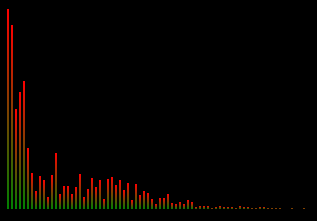 The normalized version will generally have sharper differences between the height of each bar because the highest volume across the bars is searched for, multiplied up to become 1.0 and all the other bars are multiplied by the same value, so any differences between them become exaggerated. Thanks for your help!! A lot of enhancements done in my project. I’m trying to normalize but I can’t go through with the code below. what does it mean? Finding the spec from spec[sampleSize], when spec is found and I don’t know what happens after. 2. I’ve also tried the Beat Detection in one of my songs. But the detecting accuracy seemed to be low. How can I make the accuracy increase? Of course, I did some googling and got a conclusion that smoothing and some mathematical process is needed. Is there another solution? I am Presently Getting Spectrum of 1024 pieces and Adding it all up, which is perhaps called the sound energy? and comparing the previous energy and the present energy every frames. (and other permutations) but is much neater. See my article elsewhere on the site about C++11 lambda functions for more details on both the lambda syntax and std::transform. 2. The example above for beat detection is very crude and will only work well on eg. dance music with a clear beat. Comparing the energy across the entire sample range won't work because you are looking at all the frequencies at once; what you really want to do is just look at frequencies in the range of a bass drum etc. and compare the energy in that narrow band of the spectrum. The best solution as you mentioned is to use a smoothing function and monitor the small desired range of frequencies over several frames, being careful not to average over too many frames as that would introduce lag into the beat detection. I hope that helps! Katy. Is there any way for this to be worked on for a mac? It should do if you download the Mac version of FMOD, but I’m afraid I don’t know the specifics, only the Windows API. You will need to go through the FMOD Mac documentation and make the appropriate changes. Thanks so much for writing this article. I started working on a music visualizer a couple months ago and finished the graphics engine. The thing is I’ve never done any audio coding. Google was not much help with this. I was about to start using VAMP and was cringing at the thought of having to write a host application and using a bunch of extra libraries to decode compressed audio. I’m so glad I did one more round of google searches and found your tutorial. I’ve got the basic stuff up now and it got me on track to doing what I want to do. Finally all that audio theory stuff from school is starting to be useful! I have one question. Is there any way to get the frequency of a mp3 so that I don’t have to hardcode 44khz and expect all files to be that way? I saw elsewhere you can determine it by taking the filesize and comparing it to the length of the song but I imagine that wouldn’t work for VBR files. Does FMOD have any facilities for returning the frequency of a file? Once you have loaded a sound with System::createSound (or createStream) you can call Sound::getDefaults on the FMOD::Sound handle returned by System::createSound to get the default frequency, eg. I followed your tutorial up until the step you output the data because I will use it for a different purpose. I’m interested in finding the frequency of the wav file I opened with FMOD. For testing purpose, I generated a SINE wav file with 440 Hz, sampled at 8kHz online. From the formula you provided above: freqRange = (8000 / 2) / sampleSize, my sampleSize = 1024; therefore, freqRange = 3.9 hz per bin; since I already know the frequency of the wav file I’m inputting, I’m expecting to have larger value around bin #113 compared to other bins. But What I got was not what I expected, I got the largest value in bin # 512 = 3.469e-9 and second largest at bin # 256 = 3.205e-9. The last part I was messed up for some reason. Above is the correct one I used. If you are running this code as shown then you’re going to have problems. The code itself is correct, but you are fetching the spectrum immediately after the song starts playing, possibly before it starts playing, so you will get inaccurate results. The FFT calculation performed by getSpectrum uses historical data (ie. the last ‘sampleSize’ frames of playback) to calculate the amplitude in each frequency range, so it won’t return any meaningful data until the first ‘sampleSize’ samples have been played. Additionally, you need to call System::update repeatedly in a loop (usually once per frame of animation in a game will suffice, for example) to update FMOD’s internal state, otherwise many functions including getSpectrum won’t return the expected results. I’m trying to make some kind of beat detection using FMOD for some personal projects of mine, so your post is very, very useful and I’ll dig seriously into it this week, as I currently use a temporal approach to detect beats (it doesn’t work well). I’m trying to find the best way to use frequency to do the same thing, and quickly looking at your results and testing your demo app with some more musics convinced me FMOD could get me where I needed. However, I have a slight restriction, in the fact I need to make my beat detection BEFORE reading the music (I actually want to generate a file containing the meaningful data I can gather from automated analysis). All I’ve read about the getSpectrum function in FMOD tend to let me think it can only work if the sound is currently playing. Would you have a clue about how to work around this? Do you think reading the sound at high speed (like, 4x faster) would allow me to do it? While this is not a problem for the file generation thing I’m wanting to do right now, I’d like to reuse my system in a game that generates levels procedurally (using information extracted from a music file), and waiting a whole song time for the level to get ready isn’t really an option. Thanks for this article anyway, it will be really helps! I don’t know a way to do this. In fact the next part of the series will be about doing the same frequency analysis as here, but on the live sound card output, and even for that I had to record then silently playback the output signal at the same time, calling getSpectrum() on the played back signal. Looking at the “pitch bend” example that comes with the FMOD SDK, they do it the same way. So, I really don’t know how to do it in non-real-time using FMOD I’m afraid. Thanks very much for the excellent article! I’m attempting to work on a prototype that requires running FFT (and probably other algorithms) on the entire audio file before drawing anything with the data. Is this sort of iteration possible with FMOD in non-realtime? I’ve read elsewhere that perhaps createSound (for loading the file into memory) and seekData() are possible avenues for me to look through. What do you think? As far as I can see (and I’m not an expert on FMOD by any means), you can only FFT sounds that are playing (see the problems I had with this in part 6 about recording sound card audio). You can of course use an external FFT library to do the processing. I’ve heard a few people mention Arduino lately, and StackOverflow provides some suggestions (http://stackoverflow.com/questions/463181/c-c-fft-library-with-non-gpl-license) on others you could investigate. Hope that helps! You don’t need the wrapper, it’s just to make the example simpler and only deal with FMOD-related code and not boilerplate stuff specific to Windows (or Linux). Sorry, for bothering you, but recently I’ve encountered uninteligible problems which I cannot overcome – the first one is that channel 0 is completely silent, while channel 1 is working ‘fine’ (getSpectrum of channel 0 returns nothing to an array). The second one is that I cannot set sampleSize below 8192 (on 4096 spectrum readings are ‘choppy’ and below this value they won’t ‘show’ at all). Could you point me a hint what may be wrong? Sounds like a bug in your sound card driver – I had almost identical problems with the Creative Audigy 2 ZS drivers. Use a recording program like Audacity and a sine wave generator (eg. YouTube video of sine wave sound), record it and see if it records a clean sine wave or not. If so, the problem is probably with your code; if not, the problem is your sound card driver. Good luck! how can change the bass/treble/other frequency sound in fmod…? i want about equalizer , not analyzer…. Awesome!!! Thank you very much, this really helps while diving in to FMOD FTT audio analysis. Great article.